We all know that keeping a good posture is important. Not only does it help prevent aches and pains from developing due to certain muscles being under tension most of the time, it also considerably improves your body language and makes you look commanding and capable. Bad posture leads to poor bio-mechanics, and over time this might build up to something that could lead to an unexpected injury such as a stress fracture of any of the plethora of medical conditions ending in -itis. If bad bio-mechanics can result in all this for someone with a sedentary lifestyle, you can bet that it will lead to even more serious issues for someone with an active lifestyle; case in point, a runner. Poor control of the position of your spine and hips means you can’t take advantage of the storage and release of elastic energy that enables you to run efficiently. Poor posture is also the primary cause of low back pain in runners, and it plays a major role in injuries anywhere from your hips to your feet. Improper posture causes a whole host of problems: It shifts your center of mass back, causes you to land too far in front of your body, accentuates over-striding, and impairs your ability to activate the muscles that stabilize the spine and the lower legs–by as much as 50 percent. With poor posture, all your hard-earned core strength won’t transfer into your running form. Better posture means better muscle recruitment. The first non-negotiable in a runner’s posture is the ability to keep the spine in a neutral position while having enough mobility to swing the leg forward and backward. Let’s imagine your pelvis as a cereal bowl that is perched on top of your legs. The major muscles in front of the cereal bowl are your hip flexors (psoas major and minor as well as rectus femoris). If they are excessively tight, they will pull your cereal bowl down in front, and your Cheerios just landed on your toes. Likewise, the major muscles running from the cereal bowl to the back of your legs, your hamstrings, will spill your cereal backward if they are excessively tight. The most common problem I see in runners is tightness of the hip flexors. We can thank sitting at our desks for hours on end for this. Hip flexor tightness pulls our spine into more of an arch, places our hips in a more flexed position during gait, and prevents us from swinging the legs behind us properly during push off. Instead of extending your hip, you wind up extending your back. The fix is to open up this tight, bound-down region with a very specific stretch targeting your psoas. KNEELING HIP FLEXOR STRETCH: Kneel on one knee inside a door jamb such that the femur of the leg you are kneeling on is vertical, and the tibia of the opposite leg is vertical. In the picture, a vertical bar was used instead of the doorway simply to provide a better visual. In this position, you’ll naturally have a bit of space between your lower back and the wall. Tilt your pelvis backward so the hollow between your lower back and the door jamb disappears. (Imagine tilting a bowl of cereal so that it spills behind you.) You’ll feel the stretch in the front of your hip and down the front of the thigh. Hold this continuously for three minutes. Repeat four to six days a week. The second non-negotiable is the ability to extend the hip behind you while keeping the spine stable. As running speed increases, the proportion of force you produce at the hip must increase. In short, your gluteus maximus must produce more force. While the hip flexor stretch mentioned above improves mobility, it doesn’t generate strength to get the hip behind you during push off. Your gluteus maximus has the best mechanical lever arm of any muscle in your body, and it is your most fatigue-resistant muscle. Unfortunately, most runners can’t even tell the difference between moving their back or their hip, much less isolating their glutes. The donkey kick is a great way to learn to keep your core in neutral while isolating the gluteus maximus to extend your hip. BALANCED DONKEY KICKS: Begin on all fours with a 4-foot dowel (PVC or a weighted bar are both fine) across your back. Keeping the spine and dowel as still as possible, extend one leg back and slightly to the side. The dowel provides instant feedback to ensure you are moving correctly. If you rock your body or the dowel excessively, make smaller movements until your control improves. Do 50 reps for each leg. Do this daily for two weeks, then one to two times per week for about six weeks. The final non-negotiable is the ability to maintain neutral. There isn’t another exercise for this–instead, it’s something to think about while you are walking, running and doing your current core exercises, so that you’ll have effective transfer of your core strength into your activities. Because everyone has a little different shape to their back, a neutral spine is different for everyone. Some people have more of a lumbar arch and some have less. It’s OK if your lumbar neutral is different from a friend’s. The often taught “Draw the belly button up and in” to flatten the back sends your spine position from one extreme to another, and it is not a functional way to engage the core or run. Instead of activating your spine stabilizers, this cue engages the muscles that move your spine. And that does not make for a stable spine. Neutral means the middle of the range of motion. Finding a neutral spine: Stand with your feet a comfortable width apart. First think about where your weight is. More in the heels? More on the midfoot? To find the correct position, place one hand on your belly button, and one hand on your sternum. Imagine that the hand on your belly button is blocking your pelvis from shifting forward. Then drop the upper hand and sternum forward, bending slightly at the waist (not the ankle and knee) until you feel weight equally distributed over the forefoot and rearfoot. Aim to re-create this position anytime you walk or run. This your new normal posture. If you are someone who normally stands with a large arch, it may feel almost like you are leaning forward, because your perception of neutral has been too far back. The more you practice good posture when not running, the easier it will be to find and maintain it mile after mile. If you like what you’ve been reading so far, please go like our Facebook Page and also that of the soon-to-be conducted first ever Manipal Marathon. More details in the upcoming weeks! The second part of this article will shift focus on one of the most debated topics of the running world: Is heel striking good or bad? I’ll try to present some facts and theories and leave you to work out what’s best for you. Let’s first take a look at the individual components that make up a single stride, collectively referred to as the Gait Cycle. We considered two phases: the Stance Phase (during which your foot is in contact with the ground) and the Swing Phase (during which the same foot is off the ground). The ankle, knee and hip all extending (triple extension) to push the body up and forwards using the elastic energy absorbed during braking, up to the moment when the foot leaves the ground (toe off). This marks the beginning of the Swing Phase, a passive stretch reflex mechanism that fires the now non weight-bearing leg forwards, until the Gait Cycle for that particular leg starts once again with initial contact. Now, Although running depends on whole body interaction, being aware of the individual components of the Gait Cycle can help you appreciate how slight modifications to your running form can have a knock on effect that can lead to overall improvement in performance and less susceptibility to injury. It is difficult for scientists to find a direct link between heel strike and running injuries. Running injuries are often multifactorial, thus all we can come up with are predictors of running injuries that relate to foot strike. Its tempting to draw conclusions that heel strikers have more frequent and severe running injuries than forefoot strikers. However to be fair, you could argue that in the recreational running population, there are more heel strikers than forefoot strikers which may suggest the higher incidences of injury. Research evaluating the metabolic cost of running also shows no clear advantage for a more forward contact point. In fact, most studies suggest the vast majority of recreational runners are significantly more efficient with a heel-first strike pattern. In a detailed paper published in the Journal of Experimental Biology, scientists cal­culated joint torque, mechanical work performed, and muscle activity associated with altering initial contact points at various speeds of walking and running. The results of this study con­firmed that walking with a heel-first strike pattern reduced the metabolic cost of walking by a surprising 53 percent. That’s a huge difference in efficiency and it explains why almost all slow joggers (who often run just a little faster than walking pace) make initial ground contact with their heels. This contrasts with studies showing that as many as one-third of the world’s fastest distance runners strike the ground with their midfoot. Running efficiency is not so much a question of what part of the foot touches the ground first, but how close initial contact is to underneath the hips, i.e. your centre of mass. A heel strike that lands close to the hips and on a bent knee causes no significant over-braking or over-loading to the knee. In contrast to the above is the act of overstriding, where the foot comes into contact with the ground well ahead of the hips. More often than not with overstriding, it is the heel that strikes first but what is more important is the fact that, as seen in the photo below, the knee is straight and locked out. Overstriding is commonly associated with the creation of greater braking forces and excessive impact. Research has shown that a more extended knee contact angle can increase the forces experienced by the body and therefore increase injury potential. If you are overstriding, landing with your leg straight, knee locked out, you are sending a strong shockwave up your leg, which increases your risk of injury. From hamstring to achilles, and especially shin splints, overstriding is more likely to get you injured than any other aspect of your running form. Read more about this here. Today, more than ever, runners have a myriad of shoe choices, which change each year as new models are released and older models discontinued. Shoe design features range from cushioning to stability to motion control, and, more recently, there is a movement toward barefoot running and minimalist shoes that mimic barefoot running. This wide spectrum of running shoes is meant to address the various functional demands associated with the differences among runners in running mechanics and foot structure, most notably, pronation and supination and arch type. Yet the majority of runners do not possess the training or knowledge to adequately determine the most appropriate shoe for their foot and running style. Although runners now have more access to gait assessment than ever before, there is concern that some people performing gait analysis may lack the necessary qualifications. With such a wide range of individuals now able to provide various forms of running gait analyses, practitioners need to consider the training and knowledge base needed to adequately interpret the information from an analysis and make appropriate recommendations. Perhaps the most common outcome of any form of running assessment is the classification of a runner as an overpronator. It is also quite common for runners to identify themselves as overpronators. A study by Stefanyshyn et al, however, concluded that runners are generally unable to appropriately classify themselves as either over- or normal pronators. Although runners today have a vast amount of resources available to answer questions about pronation, the sheer volume of information can be confusing and overwhelming. Thus, to adequately discuss the role of pronation in running, let us first examine pronation itself. During the stance phase, however, the foot is in contact with the ground and now motion at the foot is largely restricted. To produce pronation now, we must move the segments and joints above the foot. With the foot on the ground, the eversion mechanism is still relatively the same, but the mechanism for dorsiflexion and abduction changes since the foot can’t come off the ground and can’t turn out to the side during most of stance. In this case, the tibia (lower leg) moves toward the toes to produce dorsiflexion and the lower leg rotates inward to produce abduction. The consequence is that these motions can influence motion throughout the entire leg up to the hips; moving the lower leg can influence knee motion, which in turn can influence hip motion. Since the lower leg is connected to the femur (thigh) at the knee, dorsiflexion of the foot produces knee flexion, while foot abduction ultimately produces knee rotation. What makes pronation unique as a biomechanical phenomenon is that the bones of the foot are oriented in such a way that if a person performs one of these motions, they automatically and simultaneously produce the other two motions to some degree. Thus, pronation during the stance phase of running can influence movement in all three planes within the entire lower extremity. Rearfoot eversion is one of the most investigated and assessed joint motions related to running mechanics. 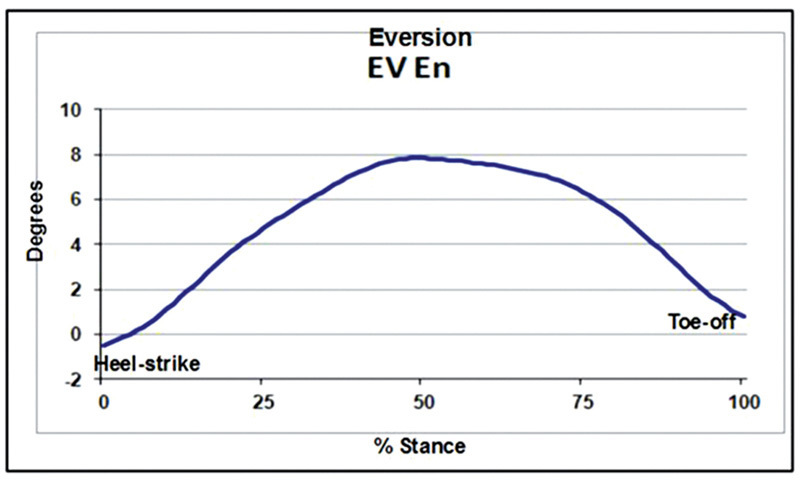 In runners with a heel-strike running pattern, who make up the majority of runners, eversion influences running mechanics the most during the stance phase. Eversion normally begins once the heel of the foot contacts the ground as the stance leg transitions from bearing no weight when it’s in the air to bearing all the runner’s weight once it’s positioned on the ground. A normal pattern of stance phase eversion in uninjured recreational runners can be seen in Figure 2. Figure 2. Rearfoot eversion curve of an uninjured recreational runner during the stance phase of running. The curve is an ensemble average of 10 trials. A negative eversion value indicates rearfoot inversion. Typically, runners hit the ground and begin stance with the foot in a neutral position (0° of eversion/inversion) or with some slight inversion (2° or 3°).10-11 The foot then undergoes eversion to a maximum value of between 8° and 12° at the midpoint of stance. In the second half of stance, the foot goes through inversion to return to the neutral position or a slightly inverted position at toe-off at the end of stance. The total excursion or range of motion for eversion during the stance phase is around 10° to 12° when runners wear a typical neutral/cushioning shoe. This entire process is accomplished in a relatively short amount of time, contributing to an average maximum eversion velocity of approximately 115°/sec.11 There is a great deal of variability in eversion from runner to runner, however, with a standard deviation for maximum eversion of about 3° to 5°.10-11 Thus, eversion could be as much as 17° and still be in the normal range. Eversion also plays a prominent role in the coordinative timing that occurs within the leg. 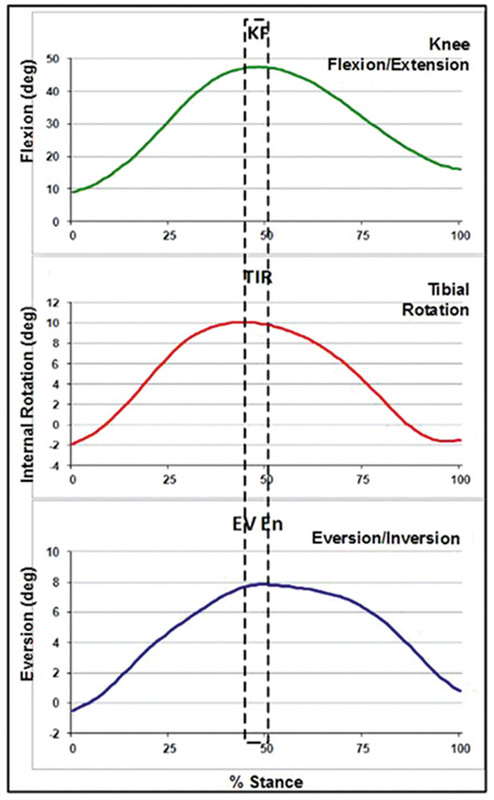 As eversion reaches its maximum at midstance, the maximums for both tibial internal/medial rotation (inward rotation of the lower leg) and knee flexion are reached at the same time (Figure 3).12-15 Once this occurs, the motions in the second half of stance reverse direction such that inversion, tibial external rotation, and knee extension now occur together. The motions of eversion, tibial internal rotation, and knee flexion are quite synchronous and smooth, occurring together in the first half of stance, reaching their maximums almost simultaneously at midstance, and then reversing in the opposite direction for the second half of stance. The mechanics related to eversion facilitate several functional roles during running. First, eversion acts as one of the primary mechanisms to absorb impact shocks as the foot strikes the ground.16 Second, eversion helps stabilize the ankle joint as the large deltoid ligament on the medial side of the ankle is tensed with eversion, while the wider portion of the talur head locks into the ankle joint mortise with dorsiflexion.9 Stabilization of the foot must occur in order for the stance leg to stabilize as all of the runner’s body weight is transferred onto this foot and leg during stance. The foot must also be flexible during early stance to allow it to conform to the ground, especially when the surface is not entirely flat. As long as rearfoot eversion isn’t extreme, the midfoot and forefoot have some flexibility to either evert or invert, allowing for adaptation to the terrain.9 All in all, rearfoot eversion/pronation is a joint motion that normally occurs during running and allows functional demands to occur. But since eversion has the potential to influence motion throughout the entire leg, it has long been viewed as a potential injury mechanism if abnormalities develop. Figure 3. The synchronous motions between the foot and knee during the stance phase of running. During the first half of stance, rearfoot eversion, tibial internal rotation, and knee flexion occur together, reaching their maximums at about the same time at midstance, then reverse back the other direction for the second half of stance. The dashed box represents a 5% window wherein the maximums occur normally. Each curve is the ensemble average of 10 trials from an uninjured, recreational runner. While there are certainly several mechanisms in which abnormal eversion could be related to injury, it is important to note that such a cause-effect relationship has not been directly established in the literature to date. Studies have often shown a relationship between abnormal eversion mechanics and injury, but these studies were not designed to determine cause-and-effect outcomes.